I'm having a right proper resurrection day after Black & Blue Ball. Speaking of balls, I'm sitting on my new fitness ball. Does my writing seem bouncy? I am bouncing a little bit. I mean, I'm going to do more with this ball besides using it as a desk chair. Anyway. During my post-divorce pre-derby period, I was going out, you know, kind of a lot, and I wasn't working because I was writing my screenplay, and I used to give myself resurrection days to recover after nights out. I named them after the resurrection process in Battlestar Galactica, where the Cylons wake up in a bathtub full of goo. Not that it ever got that bad, but I actually needed a full day to recover after a night out. Which I eventually reevaluated as too much of a price to pay and started watching more Project Runway instead. I mean, I didn't drink last night. It's just been a hella long week, I was holding 'em all week and today I woke up knowing I could fold 'em. I'm actually skipping agility practice tonight. I'll see how I feel tomorrow, too. So I drank some gatorade and decided to photograph myself in my hockey helmet, and also my shin guards, and I was laughing to myself as I set the self-timer that it was a good thing that nobody could see me sitting on this fitness ball in my hockey helmet and my shin guards, with my right sock pulled down to show the shin guard. Except that you totally can, because I took pictures! Wednesday, though, I get back on the horse. I upgraded my index card system, as you can see. Mondays and Wednesdays I write Livestrong articles, which are the yellow cards. Tuesdays and Thursdays I do league work, which are the blue cards. Fridays, Saturdays, and Sundays I write my blog entries for the week, which are the red cards. The cards over get moved across the week, until they're finished and they get filed. 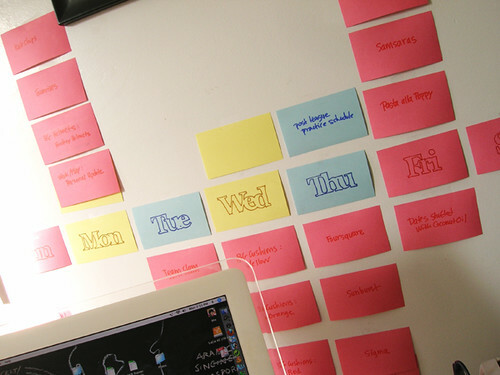 The cards under are my week by week blog plan, which is generally systems on Monday, fashion on Tuesday, gear on Wednesday, fitness on Thursday, and food on Friday. I mean, for now. I have to figure out what I'm going to do about work, don't I.